From the culling of the apples, we then went off to Peggy who had a beautiful lunch spread out for us to eat and warm up (dry off) before the second chapter of our travels with Peter, who refers to himself in his business as the Curmudgeon. Peter is seen second from the top in the posted pictures. 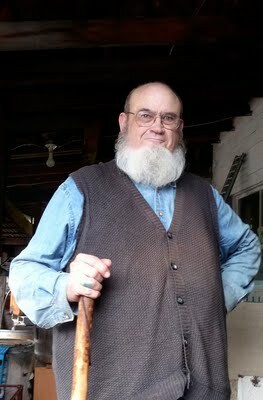 We went to his cider house and picked up all sorts of containers and milk carriers and put them in Steve's big white truck. Then, off we went to Sayre-- home of the Keystone Cider Mill-- a place that will press your cider and not pasturize it as the point of this besides delicious cider is the creation of Peter's hard cider. It was a beautiful drive. The weather had cleared up to give us a perfect fall afternoon--driving a new route for us through Danby and south through Spencer and VanEtten (two places we know of from the snow reports and school closings in the winter-- but never seen). The trees were blazing, the valleys beautiful and purple. Turns out, the Keystone Cider Mill was more that what was promised. It was a moment in time. We learned a bit from one of the family members who own the complex...Apparently, the Keystone Cider Mill and the Keystone Rollerskating Rink were at the end of the train (trolley) line and these were built to be an attraction. The cidermill also boasts a stand with a fill your own jug operation along with every sort of apple, pumpkin, squash and gourd for fall. The rollerskating rink is back to basics...a little vertically sided building with windows that illuminate a small but well maintained rink--well worn--but very viable today. We looked around back and it appears that it is heated by its own woodfired/coal fired furnace with it's own building. 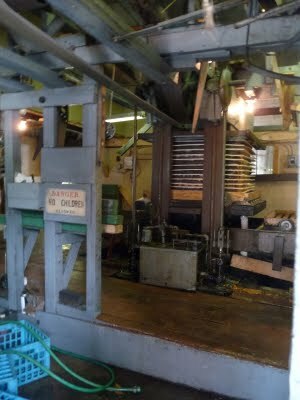 The cider press is in the back and is a jewel. 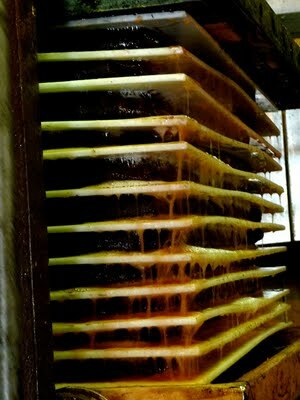 Apples are brought in and sent through a chute to a crushing process which dumps apples (cores and all) into large, wood framed layers of filtration material which is tidily wrapped up and another layer placed on top. After the layers have been filled, the whole operation pressses (from the bottom up) the apples and the juice streams down the sides (see the picture). 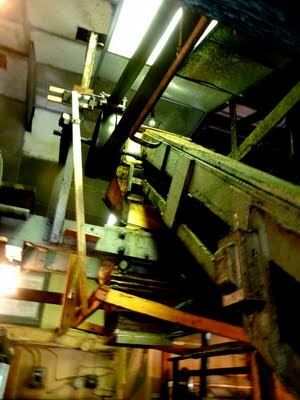 This whole operation, a Rube Goldburgian contraption, is driven by all types of belts which are driven by a tractor to the back of the building. Pretty back to basics. 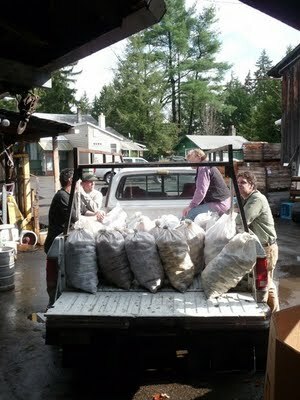 So, we unloaded 30 bushels of apples (3 of them were pears), and ended up with 220 gallons of cider. Peter refuses to buy the fruit, but gather it from friends and acquaintances who might not otherwise do anything with their fruit. While the crushing happened we all gabbed and had a nice social time until it was time to either unload more of the apples from the truck to feed the press or in the case of the strong people, load the final juice into the truck. We talked about our lives, about cider, about wine making, about food, about distilling, about those things we all had in common. There were artists, masons, biochemists, scientists, librarians, information technology people...a range of ideas and people. It was terrific. We all carried and pushed and pulled and got the cider home to Peter and Peggy's house where Peggy had a wonderful dinner for all of us. What a treat. What fun. We are so lucky to have been included in this learning and tasting time.